In this article, I’ll tell you how to deal with those shiny new architecture components and share my experience developing a project with them. Simplifying asynchronous data loading into your UI, and more. I can’t say that AAC brings a totally new approach for solving these issues, but finally we have a formal, single, and official direction. LifecycleOwner is a single method interface that provides an instance of a Lifecycle object. The library already includes a LifecycleActivity that inherits from FragmentActivity and implements LifecycleOwner. It also contains a LifecycleFragment that inherits from Fragment in the support library. LifecycleRegistry is a default implementation of Lifecycle that you can use for a custom LifecycleOwner. Note that you have to hold a strong reference to the instance of LifecycleRegistry. Otherwise, the garbage collector will collect it and the LifecycleObserver of LiveData won’t see the active observers from LifecycleOwner, and your views won’t be updated. 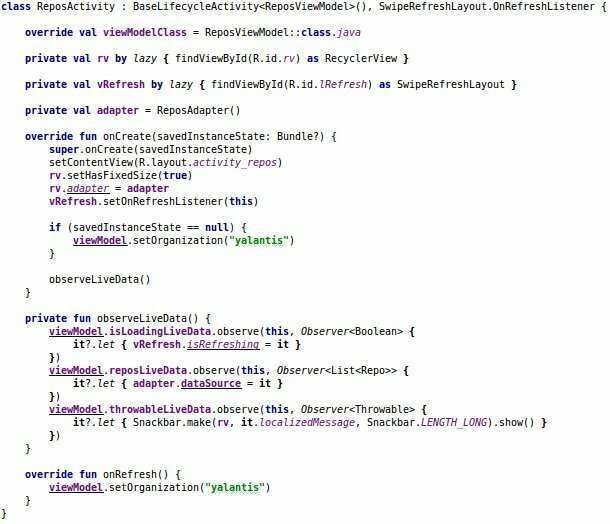 You can take a look at the source code for LifecycleRegistry to better understand lifecycle management. LiveData is a holder for some data and an implementation of the Observable pattern. It lets you detect data changes inside an instance of LiveData similarly to RxJava Observable. 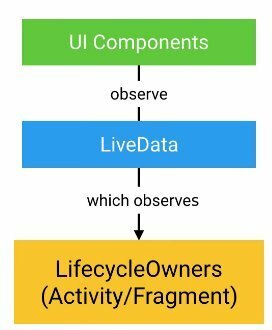 The main benefit of LiveData is that your UI components, including TextView and RecycleView, observe LiveData which, in turn, observes the lifecycle of an Activity or Fragment using a LifecycleObserver. To change the data inside LiveData, you can use the setValue method from a main thread or the postValue method from a background thread. If you call postValue multiple times before the main thread has executed a posted task, only the last value will be dispatched. MediatorLiveData is a subclass of MutableLiveData. You can use it to detect changes in other instances of LiveData. An isLoadingLiveData object observes a resultLiveData object and correctly detects active/inactive states and informs the source object about state changes. 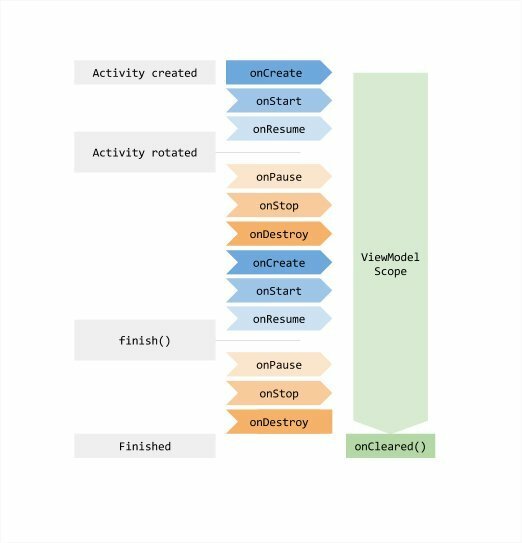 Thanks to LifecycleOwner, ViewModel has the simple view of the lifecycle of an Activity or a Fragment: initialization and cleaning. The instance of ViewModel isn’t destroyed during configuration changes. 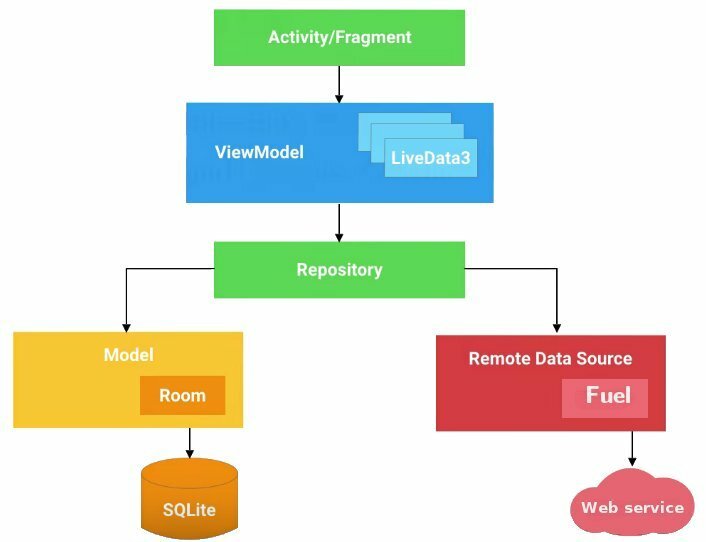 The new Activity gets the existing ViewModel object and immediately receives latest data with the use of LiveData. This persistence makes ViewModel a really powerful and convenient tool for dealing with lifecycle changes. 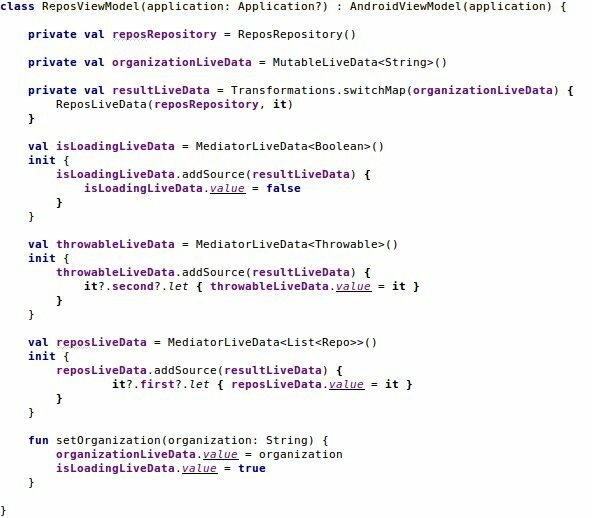 Using LiveData as a type of ViewModel field is the best practice for creating a screen with a mutable state of view data as well as asyViewModelProviders, refers to the ViewModelStore to return an existing instance if one exists.nc behavior. Such a system immediately reacts to changes. ViewModelProviders, refers to the ViewModelStore to return an existing instance if one exists. 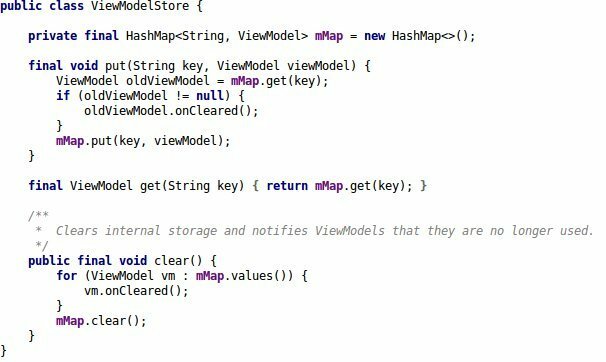 The ViewModelProviders library also contains the AndroidViewModel class that takes an Application as an argument in the constructor. 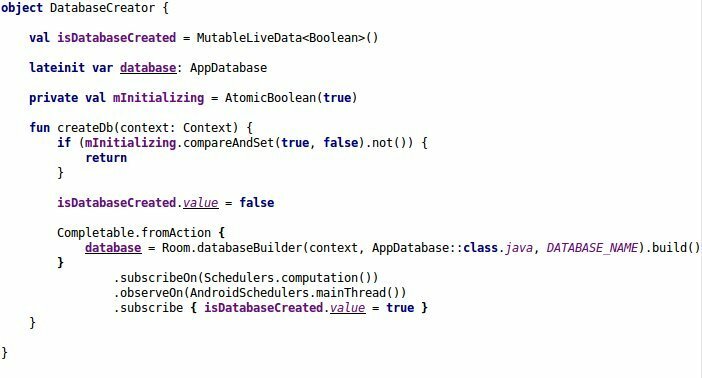 The combination of LiveData, LifecycleOwner, and ViewModel solves the main challenges faced by Android developers, such as boilerplate code and modularity. I decided to create a sample project to explore this concept. The app I created just gets a list of repositories from Github and shows one using RecyclerView. Transformations is a util class that has two methods: map and switchMap. Both take two arguments – source LiveData plus a function – and create a new LiveData instance. This LiveData instance then reacts to changes in the source LiveData and applies the function it has been passed. ReposLiveData takes an instance of Repository and the name of an organization, loads data, and sets them up to the LiveData instance. 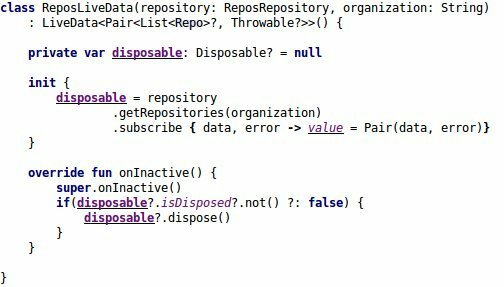 An onInactive() method is called when the number of active observers changes from 1 to 0, giving the opportunity to dispose of a Single in RxJava. ReposLiveData is one of the ways to convert a live collection of RxJava to LiveData. Let’s move to implementation of the Repository pattern and explore the Room component of AAC. My sample project invokes a request to the Github API and saves the result to local storage. This helps me get existing data from a database without the need to use expensive requests to the GitHub Rest API. This is also why the app can work without an internet connection. It’s an ORM (Object-Relational Mapping) library, so you don’t have to write boilerplate code to convert Cursor to POJO (Plain Old Java Object) or to SQL queries. The annotation defines a list of entities and the schema version. AppDatabase’s content defines the list of data access objects (DAOs) in the database. To create a database asynchronously, I used singleton design pattern and Builder from the Room class. You can use isDatabaseCreated LiveData to detect when the database has been created. Finally, we can invoke the createDb method from the App class. An Entity is a class that holds a database row. /entities/Repo.java:51: error: Room cannot pick a constructor since multiple constructors are suitable. Try to annotate unwanted constructors with @Ignore. A DAO represents a class or interface as a Data Access Object (DAO). DAOs are the main component of Room. They allow you to define the methods that access the database. Classes annotated with @Database must contain an abstract method that has 0 arguments and returns a class annotated with @Dao. When generating code at compile time, Room creates an implementation of this class for you. Traditionally, I’ve used Retrofit to deal with HTTP. But in this sample, I decided to try the Fuel library. This is all that you need to perform the request. Using FuelManager, you can set up interceptors or SSL certificates, so it’s a really convenient and useful library. Together, this set of libraries provides the basic components needed to create modular, testable, and robust Android apps. But that doesn’t mean that these libraries only work as a complete package. If you don’t want (or need) all of them, you can just pick the ones that you do need. Now you know how to combine AAC with the Repository pattern and how to create a robust Android app. Both Java and Kotlin work with AAC. The source code is available on Github.